Jazz isn't planned... it just happens! Formed in 2005, The JazzHappensBand is a traditional Dixieland jazz band operating out of Cortland, New York with a repertoire of Dixie, blues, and quick stepping jazz. 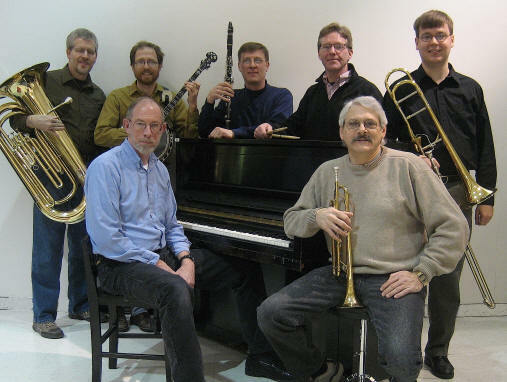 Re-organized in 2007, this talented group of local musicians features Jeff Dovi on trumpet, Mike Poole on trombone, Nick Pauldine on clarinet, Jim Overhiser on tuba, Robbert van Renesse on banjo, Steve Wilson on piano, and David Alexander on drums. The JazzHappensBand has entertained at a variety of locations and organizations including the Jazz Appreciation Society of Syracuse, the Flower City Jazz Society of Rochester, the Twin Tiers Jazz Festival in Elmira, the Turning Stone Resort and Casino, local summer music series in Cortland and Homer, the Cortland Wine and Arts Fest, the annual Fall Creek Porchfest in Ithaca, as well as for many businesses and private functions in Central New York. 2019 Calendar of Events is here! We are happy to announce the availability of our very first CD! Now you can listen to the JazzHappensBand play your favorite traditional jazz tunes any time you want. Purchase one today! Click here for details. Remember, there's more to Dixieland than just Mardi Gras in New Orleans. Dixieland music is perfect for any occasion at any time of the year. A Dixieland band will keep your guests dancing and tapping their toes all night long! Contact us today! For problems or questions regarding this Web site contact our Website Administrator.